Served with white fish roe, creme fraiche, red onions and lemon. Friterad och serveras med oliv & tomattapenade samt färskostcréme. Deep fried and served with a tapenade on olives and tomatoes. Serveras med färskostcréme och sallad. Served on a bed of mixed salad with herb cream cheese. Svensk Oxfilé. Serveras med kapris, rödlök, dijonsenap, betor och rå äggula. Swedish fillet of beef. Served with capers, red onions, dijon mustard, beets and raw egg yolk. Deep-fried red shrimp from Argentina, pickled red cabbage, guacamole and pico de gallo. Halstrad och serveras med pancetta och svampduxelle, vitvinsås, potatispuré, torkad svartkål samt smördeg. Broiled and served with pancetta and mushroom duxelles, white wine sauce, potato puré, dried black cabbage and puff pastry. Grillad och serverad med brynt kycklingfond, färskpotatis, betor och krassemajonnäs. Grilled and served with broth from browned chicken, potatoes, beets and cress mayonaise. Grillad och serveras med broccoli, pak choi, sesam, soya, lotusrot samt misomajonnäs. Grilled and served with brocoli, pak choi, sesame, soy, lotus and miso mayonaise. Grilled and served with truffle puré, tomatoe gravy and tapanade on olives and tomatoes. Serveras med rostade valnötter, betor och getostcréme. Served with roasted walnuts, beets and goat cheese créme. Serveras med pumpacréme, syltad pumpa, flowersprouts samt potatisgratäng. Served with pumpkin créme, pickled pumpkin, flower sprouts and potato gratin. Svensk grillad oxfilé, bearnaisesås, rödvinssky, baconrulle, bakad tomat och dushessepotatis. Swedish fillet of beef, bearnaise sauce, red wine sauce, bacon roll, baked tomato and duschess potatoes. Marinerad & grillad, serveras med spetskål, smörbakad svamp, citron och sellericréme samt hasselnötsmajonnäs. Marinated and grilled, served with cabbage, buttered mushroom, lemon and celeric créme, hazelnut mayonnaise. Grillad och serveras med risotto, bakade betor, getostcréme samt rödbetschips. 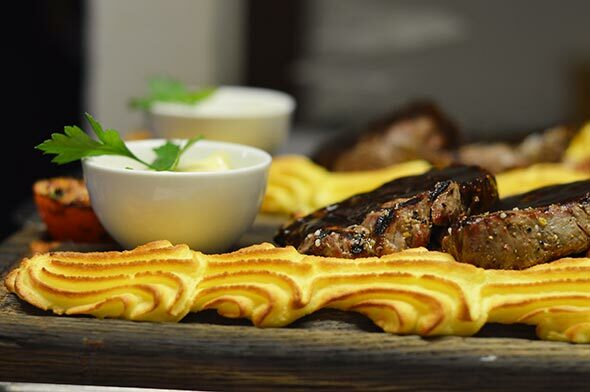 Grilled and served with a risotto, baked beets, goatcheese créme and beetroot chips. Svensk Oxfilé. Serveras med kapris, rödlök, dijonsenap, betor, rå äggula och pommes. Swedish fillet of beef. Served with capers, red onions, dijon mustard, beets, raw egg yolk and french fries. Smaksatt med brynt smör. Serveras med mandelbiscotti. Flavoured with browned butter. Served with almond biscotti. Serveras med Champagne och yoghurtsherbet, färska bär, hallontapioca samt havrecrisp. Served with Champagne and yoghurt sherbet, fresh berries, raspberry flavouered tapioca and oatcrisp. Serveras med chokladdraperade popcorn, fudge, marshmallowscréme samt cocacolasorbet. Served with chocolate draped popcorns, fudge, marshmallow créme and coca cola sorbet. Serveras med mandelkaksmulor, chokladjord, päroncréme, after-8 glass samt rulltårta. Served with almond coockie crumbles, chocolate dust, pear créme, after-8 ice cream and swiss roll. Ask us about what flavoures we have.